I’ve just stumbled across a great language learning website that you can use to sharpen up your listening, reading and writing skills in a really fun way. At Lyrics Training you can choose any of the uploaded You Tube music videos and select one of three challenge levels: Beginner, Intermediate or Expert. If you choose the ‘expert’ option you have to fill in every single word which is, in fact, very challenging even for native language speakers. If you manage to do it successfully, you can consider yourself a real expert! 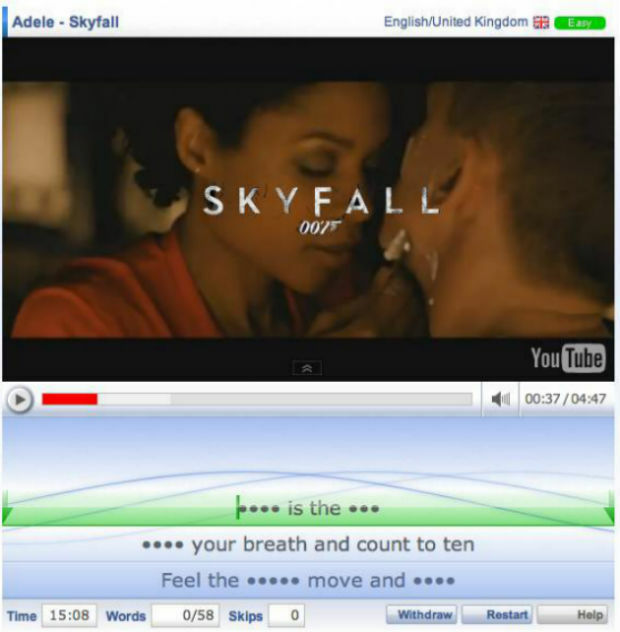 As the video plays, the lyrics of the songs appear beneath the video with some words missing. Your job – as you may have done in your language learning classes – is to fill in the gap with the correct word which you will get by listening to the song very carefully. If you have trouble understanding the word that’s missing and don’t fill in the gap, the video stops playing until you are able to enter the correct word. If you just can’t get the missing word, you can click on the ‘withdraw’ button and the complete lyrics of the song will be revealed. There is also a timer below each video so that you can see how long takes you to guess all the missing words correctly. If you chooses to, you can then go back and do it again to see how much quicker you can do it the second time around. You can locate songs using the search bar at the top of the page, where you can search by artist, lyrics, song title or, as they say on the site, ‘whatever’! For more options, click on the ‘More Options’ tab and you will see that you can search by title, artist, album or genre. Unfortunately, there are only 7 languages (English, French, Spanish, Dutch, German, Italian and Portuguese) catered for at the moment but I wouldn’t be surprised if they don’t keep adding languages over time. Hopefully, for all our Cantonese or Mandarin learners, they will be adding some good Chinese pop songs to the site soon. They should do, because there are plenty of them out there on You Tube. The site also invites you to send in comments, suggestions and your favourite songs. It won’t cost you anything to use this site (although you never know, that may change in the future), but you do have the option to create an account where you can keep a check on the results of the songs you have attempted. Is this site going to make you fluent over night? No, but it certainly is a fun language learning aid and will give you a nice break from all those boring grammar books. As it stands at the moment, this site is highly recommended for all Q Language students studying on one of our English courses.